Dominion Resources has awarded West Virginia Northern Community College a grant of $18,250 that will be used for computer software to aid classroom instruction in the Petroleum Technology program. 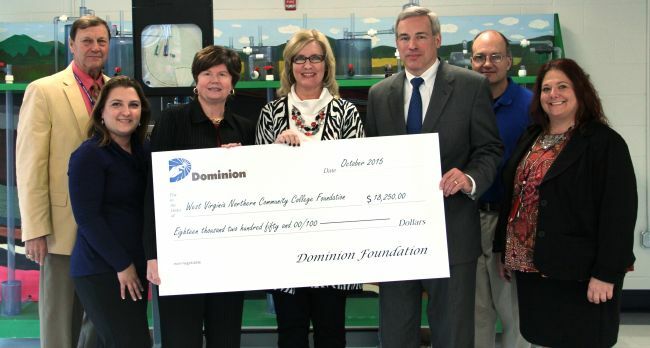 WVNCC was one of 40 higher education institutions in 11 states to receive an educational grant this year from Dominion, one of the nation’s largest producers and transporters of energy, headquartered in Richmond, Va. The grant was issued by the Dominion Foundation to the WVNCC Foundation. Also participating in the check presentation from WVNCC were Rana Spurlock, institutional advancement coordinator; Dr. David Shahan, vice president of economic and workforce development; Karri Mulhern, director of economic and workforce development; and Hippensteel.